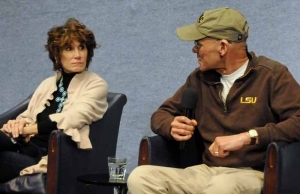 Political power couple James Carville and Mary Matalin discussed their book, ``Love & War: 20 Years, Three Presidents, Two Daughters, and One Louisiana Home'' at a Club Book Rap Jan. 11. Carville, a Democratic political consultant who helped elect Bill Clinton as president, is now a professor at Tulane University. His wife Matalin is a Republican consultant who helped George H.W. Bush and his son, George W. Bush, reach the White House. This book traces their story from 1992 till now. Matlin told said Republicans should not waver from their beliefs. Carville offered something similar, saying, ``In politics, don't try to be someone else." Joe Luchok, a member of the Club's Book and Author Committee, interviewed the couple.